The Regular Season in La Liga Argentina just ended. The round was exceptionally exciting as nine games ended with a tiny margin. Here is the last round review presented by ESL. The game between Top Four teams took place in Villa Maria. host Ameghino (11-15) smashed their close opponent Independiente (9-17) 100-79. Ameghino shot the lights out from three sinking 14 long-distance shots on high 60.9 percentage. They looked well-organized offensively handing out 28 assists. It was a great evening for forward Donovan Johnson (201-92, college: Ky Wesleyan) who led his team to a victory scoring 20 points and 7 rebounds. Swingman Sergio Rupil (191-94, college: Harcum CC) helped adding 19 points. Ameghino's coach Pablo Castro felt very confident that he used entire bench which allowed the starters a little rest for the next games. point guard Damian Palacios (177-85) responded with 13 points, 6 rebounds and 8 assists. Despite that victory Ameghino went down to first position due to points difference, which they share with Gimnasia LP and Obera TC. Independiente at the other side dropped to the sixth place with 17 games lost. The game between Top Four teams took place in Cordoba. host Barrio Parque (19-7) edged their close opponent San Isidro (19-7) 73-71. It ended at the same time the four-game winning streak of San Isidro. It was a key game for the second position in the league. It was an exceptional evening for the former international Gabriel Mikulas (201-80, college: ECU, agency: Interperformances) who led the winners and scored 18 points and 5 rebounds. Lautaro Rivata accounted for 13 points and 10 rebounds. Swingman Rodrigo Sanchez (200-89) came up with 24 points and 7 rebounds for San Isidro in the defeat. Despite that victory Barrio Parque went down to second position due to points difference, which they share with San Isidro and Olimpico Ceres. The game between Top Four teams took place in Cordoba. host Barrio Parque (19-7) smashed their close opponent Independiente (9-17) 87-60. The best player for the winners was Lucio Reinaudi who had a double-double by scoring 13 points, 12 rebounds and 4 assists. Coach Alejandro Lotterio's team controlled all game and the coach could let to play 11 players and allowed the starting five to rest. Damian Palacios produced 9 points and 10 assists for the guests. Despite that victory Barrio Parque went down to second position due to points difference, which they share with San Isidro and Olimpico Ceres. Loser Independiente dropped to the sixth place with 17 games lost. The game between Top Four teams took place in Armstrong. host Deportivo Norte (14-12) smashed their close opponent Sportivo America (4-22) 103-73. Rodrigo Gallegos orchestrated the victory with a double-double by scoring 22 points and 11 assists (on 7-of-9 shooting from the field). The winner was already known earlier in the game, so both coaches allowed to play the bench players saving starting five for next games. Deportivo Norte have a solid series of three victories in a row. Despite that victory Deportivo Norte went down to third position due to points difference. Sportivo America lost seventh consecutive game. Newly promoted team dropped to the fourth place with 22 games lost. The game between Top Four teams took place in Chaco. host Hindu (18-8) defeated their close opponent Echague (4-22) 89-76. It was a great evening for Diego Guaita who led his team to a victory with a double-double by scoring 18 points and 10 rebounds. Hindu's coach Fernando Rivero used a ten-player rotation and allowed the starting five to get some rest. Despite that victory Hindu went down to fifth position due to points difference, which they share with Estudiantes O. Echague lost fourth consecutive game. They dropped to the fourth place with 22 games lost. There were no shocking results in the rest of the games of round 35: Olimpico Ceres lost to Tiro Federal on the opponent's court 69-81. Obera TC unfortunately lost to Echague in a home game 86-89. Union SF managed to beat Salta Basket on the road 75-72. San Isidro crushed Tiro Federal on its own court 84-65. Obera TC beat Sportivo America in a road game 88-70. Villa San Martin won against Echague at home 80-76. Hindu unfortunately lost to Villa San Martin on the opponent's court 69-81. Progreso Roca managed to beat Ciclista in a home game 94-87. Rocamora was defeated by Estudiantes O. on the road 81-73. Gimnasia LP was beaten by Deportivo Viedma on its own court 72-75. Racing Chivilcoy won against La Union in a road game 83-75. Parque Sur unfortunately lost to Platense at home 68-75. Atenas rolled over Petrolero on the opponent's court 72-53. Rivadavia M. was defeated by C.Espanol P. in a home game 79-82. The most impressive stats of the last round was 23 points by Cameron Coleman of Rivadavia M.. The game between Top Four teams took place in Villa Maria. host Ameghino (11-15) smashed their close opponent Independiente (9-17) 100-79. Ameghino shot the lights out from three sinking 14 long-distance shots on high 60.9 percentage. They looked well-organized offensively handing out 28 assists. It was a great evening for forward Donovan Johnson (201-92, college: Ky Wesleyan) who led his team to a victory scoring 20 points and 7 rebounds. Swingman Sergio Rupil (191-94, college: Harcum CC) helped adding 19 points. Ameghino's coach Pablo Castro felt very confident that he used entire bench which allowed the starters a little rest for the next games. Point guard Damian Palacios (177-85) responded with 13 points, 6 rebounds and 8 assists and Bruno Ingratta (201-85) scored 18 points and 7 rebounds. Five Independiente players scored in double figures. Despite that victory Ameghino went down to first position due to points difference, which they share with Gimnasia LP and Obera TC. Independiente at the other side dropped to the sixth place with 17 games lost. The game between Top Four teams took place in Cordoba. host Barrio Parque (19-7) edged their close opponent San Isidro (19-7) 73-71. It ended at the same time the four-game winning streak of San Isidro. It was a key game for the second position in the league. Barrio Parque made 20-of-25 charity shots (80.0 percent) during the game. It was an exceptional evening for the former international Gabriel Mikulas (201-80, college: ECU, agency: Interperformances) who led the winners and scored 18 points and 5 rebounds. Swingman Lautaro Rivata (191-87) accounted for 13 points and 10 rebounds for the winning side. Four Barrio Parque players scored in double figures. Swingman Rodrigo Sanchez (200-89) came up with 24 points and 7 rebounds and point guard Juan-Ignacio Rodriguez-Suppi (178-91) added 18 points respectively for San Isidro in the defeat. Despite that victory Barrio Parque went down to second position due to points difference, which they share with San Isidro and Olimpico Ceres. The game between Top Four teams took place in Cordoba. host Barrio Parque (19-7) smashed their close opponent Independiente (9-17) 87-60. They outrebounded Independiente 44-25 including a 33-21 advantage in defensive rebounds. Barrio Parque looked well-organized offensively handing out 25 assists comparing to just 11 passes made by Independiente's players. The best player for the winners was guard Lucio Reinaudi (185-95) who had a double-double by scoring 13 points, 12 rebounds and 4 assists. The former international Gabriel Mikulas (201-80, college: ECU, agency: Interperformances) chipped in 14 points and 8 rebounds. Four Barrio Parque players scored in double figures. Coach Alejandro Lotterio's team controlled all game and the coach could let to play 11 players and allowed the starting five to rest. Point guard Damian Palacios (177-85) produced 9 points and 10 assists and forward Patricio Alloco (199-86) added 16 points and 6 rebounds respectively for the guests. Despite that victory Barrio Parque went down to second position due to points difference, which they share with San Isidro and Olimpico Ceres. Loser Independiente dropped to the sixth place with 17 games lost. The game between Top Four teams took place in Armstrong. host Deportivo Norte (14-12) smashed their close opponent Sportivo America (4-22) 103-73. Deportivo Norte shot 60.3 percent from the field. Deportivo Norte outrebounded Sportivo America 46-23 including a 39-17 advantage in defensive rebounds. They shot the lights out from three nailing 13 long-distance shots on high 54.2 percentage. Deportivo Norte players were unselfish on offense dishing 32 assists comparing to just 14 passes made by Sportivo America's players. Point guard Rodrigo Gallegos (180-91) orchestrated the victory with a double-double by scoring 22 points and 11 assists (on 7-of-9 shooting from the field). Guard Lautaro Fraga (184-92) contributed with 23 points and 9 assists for the winners. Four Deportivo Norte players scored in double figures. Guard Nicolas Dominguez (187-0) answered with 24 points, 5 rebounds, 4 assists and 4 steals and forward Andres Meinero (197-96) added 18 points and 5 rebounds in the effort for Sportivo America. The winner was already known earlier in the game, so both coaches allowed to play the bench players saving starting five for next games. Deportivo Norte have a solid series of three victories in a row. Despite that victory Deportivo Norte went down to third position due to points difference. Sportivo America lost seventh consecutive game. Newly promoted team dropped to the fourth place with 22 games lost. The game between Top Four teams took place in Chaco. host Hindu (18-8) defeated their close opponent Echague (4-22) 89-76. Hindu looked well-organized offensively handing out 24 assists. It was a great evening for the former international Diego Guaita (204-83) who led his team to a victory with a double-double by scoring 18 points and 10 rebounds. Forward Pablo Fernandez (197-82) helped adding 19 points and 6 assists (on 7-of-8 shooting from the field). Hindu's coach Fernando Rivero used a ten-player rotation and allowed the starting five to get some rest. American forward Eric Frederick (203-88, college: Texas Wesleyan) responded with 24 points and the other American import forward Paul Larsen (198-92, college: Mercer) scored 15 points. Despite that victory Hindu went down to fifth position due to points difference, which they share with Estudiantes O. Echague lost fourth consecutive game. They dropped to the fourth place with 22 games lost. There was a minor upset in Morteros where their close opponent Olimpico (19-7) was defeated by Tiro Federal (7-19) 81-69 on Friday. Tiro Federal forced 21 Olimpico turnovers. It was a great evening for swingman Bruno Oprandi (192-85) who led his team to a victory scoring 14 points, 9 rebounds and 4 assists. Leonardo Strack (188-93) helped adding 12 points and 5 assists. Five Tiro Federal players scored in double figures. Point guard Matias Martinez (178-94) responded with a double-double by scoring 21 points and 10 rebounds and American Tirrell Brown (198-93, college: Ouachita Baptist) scored 9 points and 8 rebounds. Olimpico's coach rotated eleven players in this game, but that didn't help. Despite that victory Tiro Federal went down to ninth position due to points difference, which they share with Petrolero. Newly promoted Olimpico dropped to the second place with seven games lost. There was a small surprise when Echague (4-22) edged on the road their close opponent Obera TC (11-15) 89-86 on Friday. Echague made 16-of-19 free shots (84.2 percent) during the game. They looked well-organized offensively handing out 21 assists. It was a great evening for center Franco Barroso (207-94) who led his team to a victory with a double-double by scoring 16 points, 19 rebounds, 6 assists and 4 steals. Point guard Alan Moreno (184-97) helped adding 24 points. American power forward Chris Hooper (198-91, college: St.Francis, NY) responded with 20 points and 5 rebounds and naturalized Spanish swingman Maximiliano Martin (189-90) scored 13 points, 5 rebounds and 4 assists. Four Echague and five Obera TC players scored in double figures. Despite that victory Echague went down to fourth position due to points difference, which they share with Sportivo America. Loser Obera TC still keeps top place with 15 games lost. There was a minor upset when their close opponent Salta Basket (16-10) was edged at home by Union SF (15-11) 75-72 on Friday. It was a key game for the top position in the league. Salta Basket was plagued by 25 personal fouls down the stretch. It was a great evening for power forward Alejandro Zilli (201-82) who led his team to a victory scoring 14 points, 9 rebounds and 4 assists. Point guard Emiliano Correa (188-91) helped adding 19 points. Union SF's coach Juan Siemienczuck allowed to play the deep bench players in such tough game. Lisandro Rasio (198-90, agency: Pro Sports) responded with a double-double by scoring 22 points and 14 rebounds and swingman Gregorio Eseverri (194-86) scored 15 points and 6 rebounds. Union SF have an impressive series of six victories in a row. Despite that victory Union SF went down to first position due to points difference, which they share with Deportivo Viedma and Atenas. Loser Salta Basket dropped to the second place with ten games lost. There was a small surprise in San Francisco where San Isidro (19-7) outscored their close opponent Tiro Federal (7-19) 84-65 on Tuesday. They outrebounded Tiro Federal 46-26 including a 37-23 advantage in defensive rebounds. It was a great evening for Haitian-American James Cambronne (201-91, college: St.Michael's) who led his team to a victory with a double-double by scoring 18 points and 12 rebounds (on 8-of-9 shooting from the field). Swingman Rodrigo Sanchez (200-89) helped adding 17 points and 9 rebounds. Cambronne is a former Eurobasket Summer League player, which is considered top international summer league in the market. Four San Isidro players scored in double figures. San Isidro's coach Sebastian Torre let to play all 12 players and allowed the starting five to get some rest. Leonardo Strack (188-93) responded with 19 points and Agustin Acuna (198-96) scored 20 points. San Isidro have a solid series of four victories in a row. Despite that victory San Isidro went down to second position due to points difference, which they share with Barrio Parque and Olimpico Ceres. Tiro Federal lost third consecutive game. They dropped to the ninth place with 19 games lost. There was a minor upset in Rosario where their close opponent Sportivo America (4-22) was defeated by Obera TC (11-15) 88-70 on Tuesday. Obera TC had a 30-17 advantage in offensive rebounds. They shot the lights out from three sinking 12 long-distance shots on high 54.5 percentage. Obera TC looked well-organized offensively handing out 22 assists. It was a great evening for American power forward Chris Hooper (198-91, college: St.Francis, NY) who led his team to a victory scoring 16 points and 8 rebounds. Point guard Taiel Gomez (185-99) helped adding 10 points, 8 rebounds and 4 assists. Five Obera TC players scored in double figures. Forward Andres Meinero (197-96) responded with a double-double by scoring 17 points and 13 rebounds and guard Thiago Dubois (188-95) scored 12 points and 6 rebounds. Sportivo America's coach rotated ten players seeing no chance for a win. Despite that victory Obera TC went down to first position due to points difference, which they share with Gimnasia LP and Ameghino. Sportivo America lost seventh consecutive game. Newly promoted team dropped to the fourth place with 22 games lost. There was a small surprise in Resistencia where Villa San Martin (16-10) won against their close opponent Echague (4-22) 80-76 on Tuesday. Villa San Martin made 16-of-21 free shots (76.2 percent) during the game. They shot the lights out from three sinking 12 long-distance shots on high 52.2 percentage. It was a great evening for guard Franco Vieta (190-92) who led his team to a victory scoring 21 points and 8 rebounds. American swingman Elijah Robinson (196-95, college: Emmanuel, GA) helped adding 23 points and 5 rebounds. Robinson is a former Eurobasket Summer League player, which is considered top international summer league in the market. American forward Paul Larsen (198-92, college: Mercer) responded with a double-double by scoring 19 points and 13 rebounds and point guard Facundo Toia (179-94) scored 12 points, 7 assists and 5 steals. Villa San Martin have a solid series of three victories in a row. Despite that victory Villa San Martin went down to second position due to points difference, which they share with 3 other teams. Echague lost fourth consecutive game. They dropped to the fourth place with 22 games lost. There was a minor upset in Resistencia where their close opponent Hindu (18-8) was defeated by Villa San Martin (16-10) 81-69 on Friday. It was a key game for the second position in the league. Villa San Martin dominated down low during the game scoring 50 of its points in the paint compared to Hindu's 28. It was a great evening for American swingman Elijah Robinson (196-95, college: Emmanuel, GA) who led his team to a victory with a double-double by scoring 17 points, 11 rebounds and 4 assists. His fellow American import forward Sharwyn McGee (196-95, college: N.Alabama) helped adding 16 points and 14 rebounds (on 7-of-8 shooting from the field). Robinson is a former Eurobasket Summer League player, which is considered top summer league for players who want to play basketball overseas. Forward Pablo Fernandez (197-82) responded with 10 points, 8 rebounds and 5 assists and point guard Martin Cequeira (181-88) scored 16 points and 4 assists (on 7-of-9 shooting from the field). Five Villa San Martin and four Hindu players scored in double figures. Villa San Martin have a solid series of three victories in a row. Despite that victory Villa San Martin went down to second position due to points difference, which they share with 3 other teams. Loser Hindu dropped to the fifth place with eight games lost. There was a small surprise in General Roca where Progreso (12-14) defeated their close opponent Ciclista (10-16) 94-87 on Wednesday. Progreso made 17-of-22 free shots (77.3 percent) during the game. It was a great evening for swingman Javier Ledesma (189-81) who led his team to a victory scoring 18 points. Swingman Gustavo Maranguello (191-83) helped adding 14 points and 5 rebounds. Maximiliano Rios (182-81) responded with 24 points and American forward Corbin Jackson (198-92, college: Florida Tech) scored 16 points and 8 rebounds. Five Progreso and four Ciclista players scored in double figures. Ciclista's coach Leonardo Costa rotated ten players in this game, but that didn't help. Despite that victory Progreso went down to eighth position due to points difference, which they share with Rivadavia M. and Parque Sur. Loser Ciclista dropped to the third place with 16 games lost. There was a minor upset in Olavarria where their close opponent Rocamora (10-16) was defeated by Estudiantes O. (18-8) 81-73 on Wednesday. Estudiantes O. made 16-of-18 free shots (88.9 percent) during the game. Estudiantes O. outrebounded Rocamora 33-18 including 24 on the defensive glass. They looked well-organized offensively handing out 25 assists comparing to just 10 passes made by Rocamora's players. It was a great evening for forward Santiago Arese (196-87) who led his team to a victory with a triple-double by scoring 11 points, 10 rebounds and 10 assists. 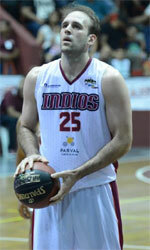 Center Pablo Moya (206-83) helped adding 16 points and 7 rebounds. American swingman Dominique Shaw (193-95, college: William Penn) responded with 25 points and point guard Facundo Gago (177-96) scored 14 points. Both teams had four players each who scored in double figures. Rocamora's coach Juan Manuel Varas rotated ten players in this game, but that didn't help. Estudiantes O. have an impressive series of five victories in a row. Despite that victory Estudiantes O. went down to fifth position due to points difference, which they share with Hindu. Rocamora lost third consecutive game. They dropped to the third place with 16 games lost. There was a small surprise in La Plata where Deportivo Viedma (15-11) edged their close opponent Gimnasia LP (11-15) 75-72 on Wednesday. Deportivo Viedma made 16-of-20 free shots (80.0 percent) during the game. It was a great evening for point guard Lucas Perez (185-87) who led his team to a victory scoring 17 points. Point guard Pedro Franco (187-81) helped adding 13 points and 4 assists. Power forward Agustin Zuvich (201-95) responded with a double-double by scoring 11 points and 10 rebounds and point guard Leonardo La-Bella (184-86) scored 12 points, 5 rebounds and 5 assists. Four Deportivo Viedma and five Gimnasia LP players scored in double figures. Despite that victory Deportivo Viedma went down to first position due to points difference, which they share with Union SF and Atenas. Loser Gimnasia LP still keeps top place with 15 games lost. There was a minor upset in Colon where their close opponent La Union (6-20) was defeated by Racing Chivilcoy (16-10) 83-75 on Wednesday. Racing Chivilcoy forced 19 La Union turnovers. La Union was plagued by 29 personal fouls down the stretch. It was a great evening for American forward Tyrone OGarro (198-94, college: Fair Dickinson) who led his team to a victory scoring 19 points and 8 rebounds. His fellow American import forward Josh Morris (201, college: Texas-PB) helped adding 17 points and 6 rebounds (on 8-of-10 shooting from the field). Swingman Manuel Lambrisca (193-97) responded with 16 points and 8 rebounds (on 7-of-9 shooting from the field) and swingman Mariano Gomez (191-95) scored 14 points and 6 rebounds. Both teams had four players each who scored in double figures. Racing Chivilcoy have an impressive series of six victories in a row. Despite that victory Racing Chivilcoy went down to second position due to points difference, which they share with 3 other teams. La Union lost tenth consecutive game. They dropped to the seventh place with 20 games lost. There was a small surprise in Concepcion de Urug. where CA Platense (22-4) won against their close opponent Parque Sur (12-14) 75-68 on Wednesday. CA Platense made 16-of-19 free shots (84.2 percent) during the game. It was a great evening for Cameroonian center Gaston Essengue (203-83, college: UNLV) who led his team to a victory scoring 18 points and 7 rebounds. Point guard Pablo Bruna (185-87) helped adding 11 points and 6 assists. Point guard Agustin Richard (176-90) responded with 14 points and 5 rebounds and Pablo Alderete (196-93) scored 14 points. Five CA Platense and four Parque Sur players scored in double figures. CA Platense have a solid series of three victories in a row. Despite that victory CA Platense went down to tenth position due to points difference. Loser Parque Sur dropped to the eighth place with 14 games lost. There was a minor upset in Plaza Huincul where their close opponent Petrolero (7-19) was crushed by Atenas (15-11) 72-53 on Wednesday. Atenas dominated down low during the game scoring 50 of its points in the paint compared to Petrolero's 28. They looked well-organized offensively handing out 25 assists. It was a great evening for Nigerian-American power forward Lotanna Nwogbo (203-93, college: Longwood) who led his team to a victory scoring 20 points and 8 rebounds. Joaquin Gamazo (198-91) helped adding 18 points and 12 rebounds. Atenas' coach Carlos Romano allowed to play the deep bench players saving starting five for next games. Naturalized Dominican forward Xavier Carreras (198-94) responded with 13 points and point guard Agustin Jure (183-91) scored 12 points, 5 assists and 4 steals. Despite that victory Atenas went down to first position due to points difference, which they share with Union SF and Deportivo Viedma. Petrolero lost tenth consecutive game. They dropped to the ninth place with 19 games lost. There was a small surprise when C.Espanol P. (16-10) edged on the road their close opponent Rivadavia M. (12-14) 82-79 on Wednesday. C.Espanol P. made 16-of-17 free shots (94.1 percent) during the game. It was a great evening for American Michael Henry (196-95, college: Buffalo St.) who led his team to a victory scoring 19 points (on 7-of-9 shooting from the field). Forward Mario Sepulveda (200-77) helped adding 15 points. Four C.Espanol P. players scored in double figures. C.Espanol P.'s coach Mauricio Santangelo allowed to play the deep bench players in such tough game. American Cameron Coleman (198-92, college: York, NE) responded with 23 points and Matias Bernardini (190-94) scored 15 points. C.Espanol P. have a solid series of four victories in a row. Despite that victory C.Espanol P. went down to second position due to points difference, which they share with 3 other teams. Loser Rivadavia M. dropped to the eighth place with 14 games lost. 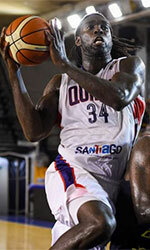 Experienced 35-year old American (has also Jamaican passport) center Torin Francis (210-114kg-83, college: Notre Dame) left Quimsa Santiago del Estero (La Liga). In 32 games he averaged 8.8ppg and 6.6rpg this season. Francis played there also last season where in 45 LigaA games he had 12.6ppg and 7.9rpg. Among other achievements he played in the final of Argentinian LigaA in 2016. Francis received also Latinbasket.com All-Liga Americas Honorable Mention award in 2017. He is a very experienced player. Francis has quite traveled the world as his pro career brought him to nine different countries on three different continents (Europe, Latin America and of course North America). Francis has played previously professionally also in Belgium (Spirou Charleroi), Germany (ALBA Berlin), Greece (AEK Athens and Panellinios), Israel (Hapoel Jerusalem), Italy, Turkey (Aliaga, Eskisehir Basket and Bornova Bld), Uruguay (Malvin) and Venezuela (Marinos and Trotamundos). He attended University of Notre Dame until 2005 and it is his 14th (!!!) season in pro basketball. Francis' game is described as: A highly-skilled and gifted athlete with game-breaking abilityversatile all-around frontcourt player who plays both ends of the floor extremely wellhas a physical offensve and defensive presence on the court and runs the floor extremely well for a player his size. Explosive in the postsmart decision maker with the ballan unselfish player who knows how to distribute the ball.